Thank you everyone for you kind words yesterday! I'm excited to finally share the news with everybody. But for now onto some monthly favorites. I can't believe that we are already a few days into February. I tried to watch my spending in January due to just finishing the holidays, so I didn't try too many new products. This month includes 2 long time favorites, with a few brand new ones in the mix. I've never been a big fan of having to dry and style my hair, but this cold weather makes me even less of one. If I straighten my hair I can usually get away with not washing it for a few days, and this is one of the products I love to use to maintain a fresh look, even if it's not freshly washed. I like that it has a nice light scent, it is completely clear, and it helps add a little texture into your hair and pick the volume back up again. It doesn't hurt that often I can spot it at TJ Maxx or Marshalls for half the full price of what you can purchase it for at Ulta. I'm still in love with my Ultrabland to take my make up off at night, but sometimes I'm just so tired and done with the day that I need something super quick and easy, and that's where these come in handy. I spotted a super size pack of these at Costco and threw them in my cart just to keep around for nights like those. These are gentle on the skin, at least they haven't irritated mine as of yet, and do a good job of getting off all my makeup, including my mascara. My only complaint is that the smell is a little too strong for me, but once I give a quick swipe with my toner and moisturizer I can no longer smell it. The next three items I scored in a pack all together on clearance after Christmas at Target for like $10. 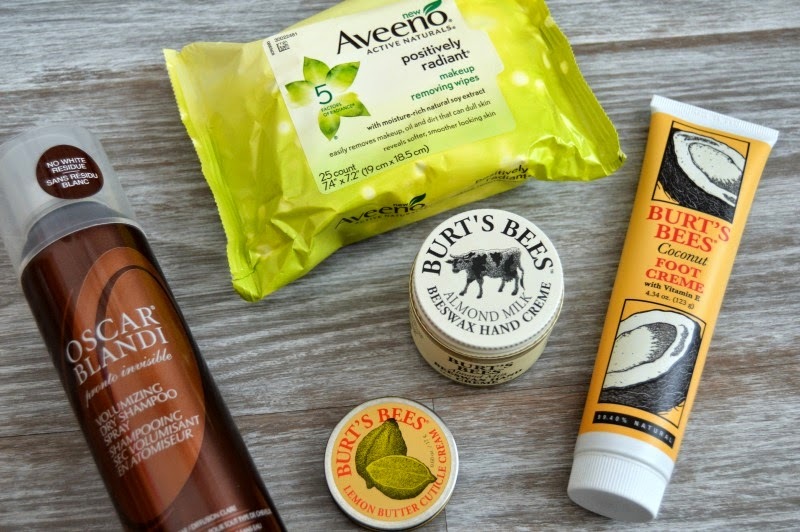 I grabbed it because I knew I loved the Burt's Bees Coconut Foot Creme and usually it costs close to $10, so it was like I got to try the other two products for free. The foot creme smells delicious, as most things coconut do. It's also super hydrating and moisturizing for dry winter skin, it help keep your feet soft and it's great for a foot rub, hint hint. 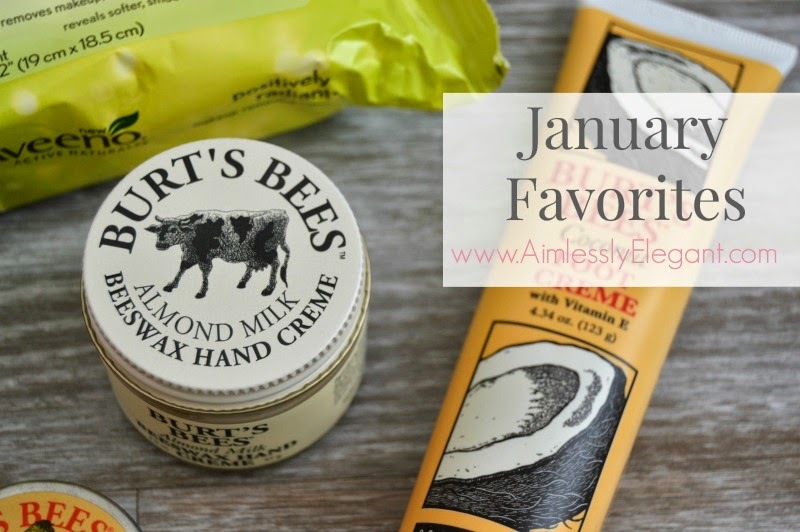 The Burt's Bees Almond Milk Beeswax Hand Creme and the Burt's Bees Lemon Butter Cuticle Cream have come in handy due to my excessively dry skin this winter. Usually I get dry skin every winter, but I don't notice it so much on my hands, not the case this year. The hand creme is super moisturizing, I keep it on my side table next to our couch and slather it on whenever we're watching tv, I like the light almond scent and it soaks in in a matter of minutes. The cuticle cream I don't use as often, just usually when I'm doing my nails, though I should probably use it a little more often. I actually love the lemon scent, and a little goes a long way. Though they're not 100% natural products, I love that they are more natural then some. What products top your favorites this month? I love those makeup removing wipes! I'll have to try the Aveeno ones. 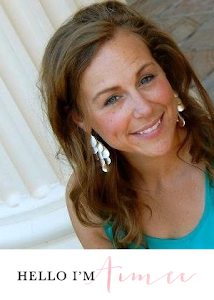 Thanks for linking up, Aimee! I've been really loving cuticle creams this year - the dry weather is taking a serious toll on my hands. I'm using a sample of the lush one right now and I love it but I would be interested to try out the Burt's Bees one to compare! Great products, lady! I've only tried the Aveeno Ultra-Calming makeup wipes, and surprisingly, they irritated my skin! I've used Aveeno products for years with no issue, so I wasn't sure what the deal was - these Positively Radiant ones sound great, though. The Oscar Blandi dry shampoo is a good one - I'll have to keep an eye out for it at TJMaxx since I never want to buy the full-price bottle. I'm a huge fan of makeup removing wipes. I use the Burts Bee's kind, though! Familiar with the Liebster Award? Well, I just nominated you for it! I’m thrilled to have found your blog and am already following you. Cheers, girl! Congratulations! I always look for it every time I'm there, it's hit or miss, but usually I can score another can before I run out! Love everything lush, haven't tried their cuticle cream yet thought. I always just scan for it every time I stop in, it's hit or miss but it totally beats paying full price! I haven't used any makeup removing wipes in years, and so far these haven't done any damage! I'll have to try those next, I have wanted to! Anything to make things a little easier! Thanks! But I have already done the Liebster Award and would love to let someone else get the opportunity!